CLOSED 24th December 2017 and reopens 3rd January 2018. Puffers Cafe is OPEN 27th-31st December! The Scottish Maritime Museum holds an important; nationally recognised and varied collection of historic ships, artefacts, shipbuilding machinery, machine tools, small vessels, canoes, lifeboats and other fascinating personal items. 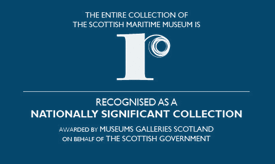 The Scottish Maritime Museum also has an ambitious three year programme to create an art collection of national significance. This growing art collection, which includes works by George Wyllie, Francis Cadell, Benno Schotz and Tom McKendrick, brings an exciting new dimension to the Museum’s nationally recognised collection of maritime heritage.